Home › Music › Now That’s What I Call Cash! Do You Have This CD Worth Over £500? Now That’s What I Call Cash! 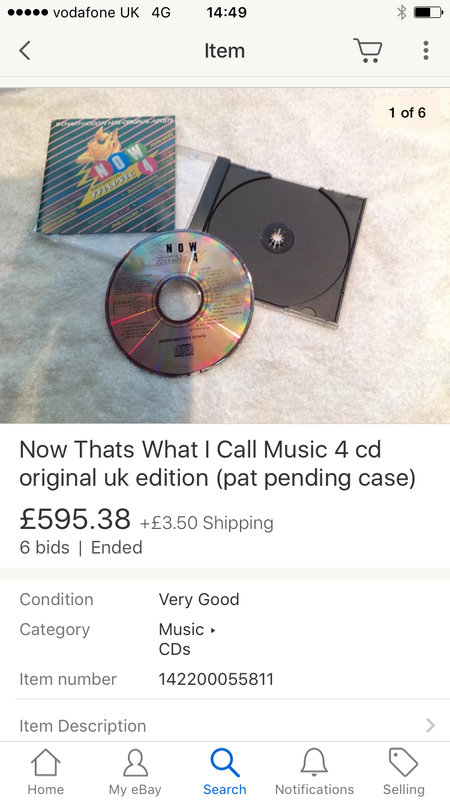 Do You Have This CD Worth Over £500? a) How can I afford the 4LP Deluxe Box Set of a 1975 Bruce Springsteen concert? c) Is it acceptable to fake a leg injury that will mean we don’t go out for dinner tonight and use the money saved to buy the Box Set? d) Given a set of circumstances where I do find the money, will my loved ones believe me if I say it cost £15? But what if there was a ready made solution already in your record collection? A record you don’t really care about that you could sell and raise the money to buy lots of nice things that you do care about, like that RSD compilation of Malian nose flute music you have quite reasonably been eyeing covetously? Well, now is the time to take a look. There is one CD which is genuinely rubbish which happens to be worth a fortune right now if recent eBay activity is any guide, and which there is a reasonable chance you may have, especially if you bought compilation CDs from the Now That’s What I Call Music series in 1984. Well, reason number one for Why It Is Rubbish is that it contains only half the tracks that the vinyl version carried. That’s pretty rubbish. You could replace it with the (non-valuable) vinyl version and have twice the music. On the other hand, maybe its brevity is the strongest selling point. Because reason number two for Why It Is Rubbish is that it contains music from such chart legends as Phil Collins, John Waite and Status Quo. Not rare tracks, mind you. There’s nothing remarkable in the music. The Wanderer. Missing You. Against All Odds. Ghostbusters. These are not rare b-sides unavailable anywhere else. It would literally take five minutes on Spotify to make a playlist of the tracks. So why £500 for a CD? What makes this CD worth over £500 is that there aren’t many of them. Not having many of something isn’t always a reason to make it valuable, of course. There aren’t many copies of last year’s RSD reissue of Europe’s The Final Countdown on blue vinyl, but that doesn’t automatically mean it’s a valuable heirloom. Why aren’t there many of them? Because in 1984 the CD format was new – this is a very early example. But if you are a collector of the Now series, it’s likely that having a gap in your collection is going to gradually gnaw away at the soul. I’m not a completist, so don’t suffer from this unfortunate affliction, but there are plenty who do, and it’s quite affecting to see. I have witnessed it at first hand. I had a friend who was like this. It’s quite the tragic tale. First he bought one compilation CD. Now 35, I think it was, in a charity shop. It seemed harmless. He said “It’s just a bit of fun”. And at first it was. FastLove by George Michael, Say You’ll Be There by The Spice Girls, Breakfast At Tiffany’s by Deep Blue Something. We played the hits of his youth, and there was a rush, and he forgot his worries for a time. But then he moved on to the next one. That first-time rush diminished. That second compilation was initially fun, but it wasnt quite as good as that first CD. Maybe the second CD had a Westlife song on it which jarred the mood. At first. So he bought more Now! compilations. More in hope than expectation. He was searching for that first-time feeling. But it was all in vain. He spent more and more money on more and more CDs. There came a time when the only Now! compilation in the shop was Now 66, and that has Eric Prydz ft Pink Floyd on it, and on hearing it he told me he just felt empty inside. And all of a sudden instead of having fun, he found he was binging on whatever Now! CDs he could find, sometimes even the lesser grade stuff from the last six years. Instead of pure musical nourishment, these CDs have been cut with cheaper, less pure material. Olly Murs. David Guetta. But instead of quitting, all he saw was the gaps in his collection and it became all he thought about. He only made friends with other collectors, but couldn’t trust them. He appeared distracted, always thinking about the next charity shop score, or was on the phone to the local CD dealer. He took time off work to seek out new CDs. He become unreliable. He was also always humming Boyzone songs. He wore a haunted look. Sure, I invited him over, concerned for his welfare and his love of Westlife, which was getting worse. We sat in the kitchen on stools and at the end of every anecdote he got off his stool to finish the story. The next day I noticed gaps in my CD collection. In my heart of hearts, I knew then I’d lost him. Because it was the first Now Compilation that was issued on CD and they only pressed about 500 or so. And it appears there are more Now! completists out there than 500. So the price has gone through the roof. £500 for a rubbish CD featuring Status Quo and Phil Collins? The world’s gone mad. (We knew that already, mind you). But that’s got to be worth braving the spiders and dust on your attic to take a look through your CD collection, right? Besides being a sober cautionary tale, I now understand why The Housemartins called their compilation what they did, cheeky lads. So some good has come of this. Ahah! Yes- hadn’t thought about this but I dare say the compilations have not crossed the Atlantic and might have been a little obscure to anyone not living in the U.K. I have, perhaps, Now 8 on tape, and I recall buying it. Or having it bought for me in the town where we were looking at moving to as I hit high school. Said shop was a regular haunt for the next 8 or so years. More visits than plays of the tape itself – my old man thought it was better value, Yorkshireman that he is. 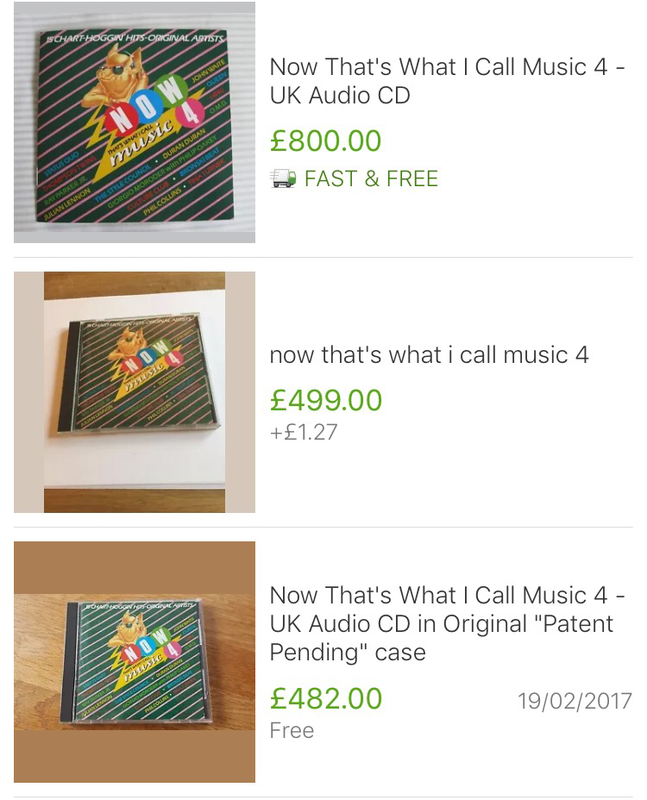 Rare CDs are becoming more of a market now – Bowie’s Sound and Vision went for £4099 on eBay in 2013 and the Slim Shady EP will set you back about £10,000! Wow. There is a Bowie Sound and Vision CD set on eBay for £250 right now. Makes me wonder whether anyone paid £4K for it! I probably wouldn’t have bought that CD based on the cover alone. I have Now 5 on vinyl, and I think Now 1 but now CD. Must keep an eye out in the charity shops!